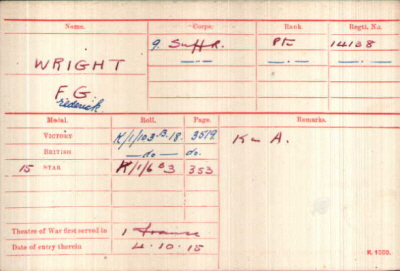 Frederick George Wright was born in 1893 in Wickhambrook (Risbridge Q3-1893 4A:706) son of George William and Jane E WRIGHT (née PETTITT). 1911 census...Aged 17, an assistant baker, he was at Front Street, Ousden with his parents (father now baker and Prudential agent), sister Ivy and brothers Allan, Charles and Cecil  born in Ousden. He enlisted in Bury St Edmunds. 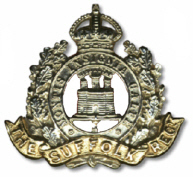 The 7th Suffolks took over trenches west of Pozières on 3rd August. On the 8th the Germans captured about 80 yards of Ration trench but that evening the Battalion retook it and gained an additionaL 200 yards. 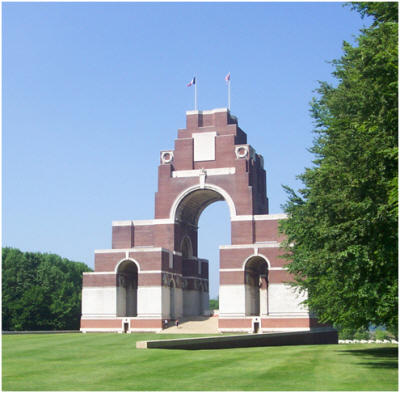 The CWGC records that the battalion lost 50 killed on the 9th August 1916, only 7 having identified graves. It is with the deepest regret that we record the death of Prvt.F.G.Wright, 14138, eldest son of Mr. and Mrs. G. Wright, which took place in France about August 10th. The sad news was received by his parents from his friend and chum, Prvt G.C.Claxton, who was by his side whenhe was killed, death being instantaneous. The deceased soldier was the first from Ousden to respond to the call of his King and Country, and joined Kitchener's army on September 2nd 1914m being also the first from the village to fall. The sympathy of the whole district goes out to the bereaved family, as deceased was well known and highly respected. He was a good son, loving brother, and an example of Christian character. I have only been with the Battery a short while myself, but during that time your son had greatly impressed me with his great cheerfulness in the most trying times, and also with his willingness to carry out any bit of work, however hazardous.